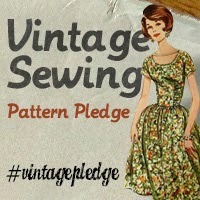 Brief update on my Vintage Pledge 4, McCall's 5297. (See last week's post for my rant on fitting.) You can see the gorgeous batik I'm using for the jacket (on sale at Hancock), and the blue is some silk I've dyed to match for the lining. 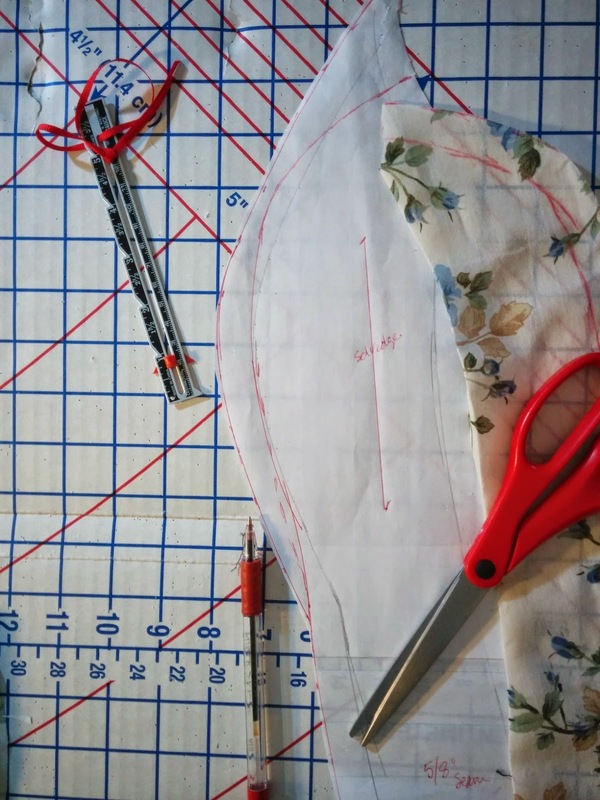 And speaking of linings, there's Connie Long's masterpiece, Easy Guide to Sewing Linings. About that silk (which I also used on this Vintage Pledge item), it's silk habotai, 5mm weight, from Dharma Trading. In order to get a "deal," I bought a whole bolt (about 50 yards). I must be nuts!/But it was a deal! I'm slowly getting through the 50 yards, but it will take a while. If I ever get all the projects done that are in my head, it will be used up; I promise. I also would like a bolt of 8mm habotai. This 5mm silk is lovely, but very light, and it needs to be sewed down as it doesn't have enough weight for gravity to keep it down. For example, I'm thinking of making a slip with it. And I will probably just double the fabric for all the parts, so there's a bit more weight and it will behave under a dress. Also, I mostly buy my dyes from Dharma, too, because silk dyes are special. 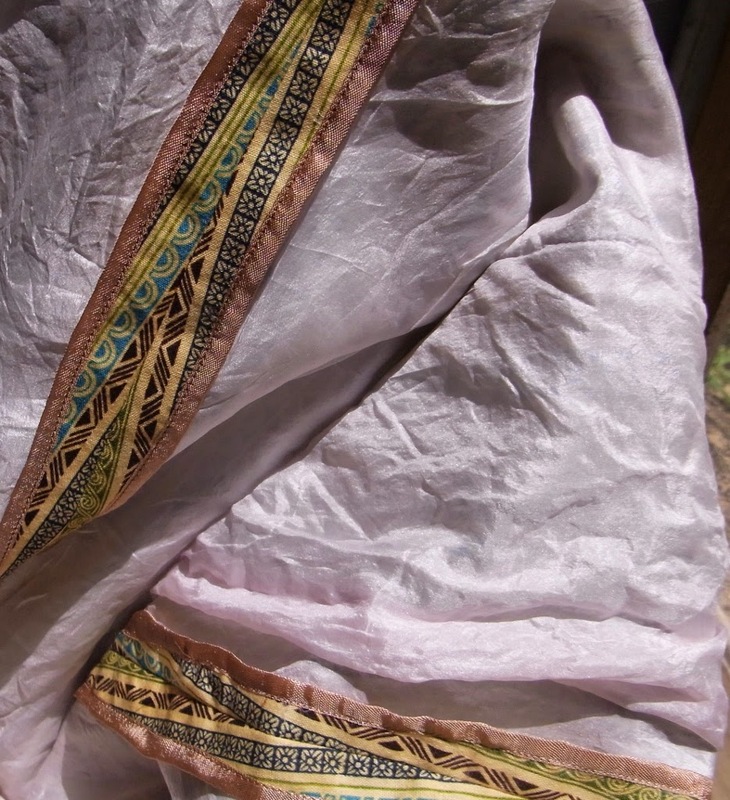 Meaning that if you buy non-silk dye (like Rit), it will work great on cotton, but won't do a thing for your silk. Follow directions carefully, and don't use your dying utensils for anything but dying. I keep all these items in our basement, well away from the kitchen. Finally, I'm still having a few more fitting issues, but I think I'm pretty close to getting this pattern modified to suit me. If I get a princess-seamed jacket that fits me out of this torturous fitting process, I will be pretty darn happy. Wish me luck! 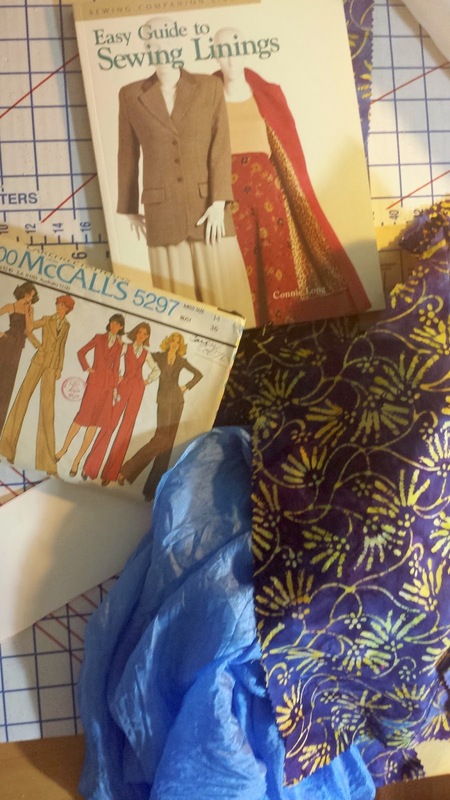 Vintage Make Four Progress Report: McCall's 5297 from 1976! Sometimes I'm not sure why I sew. It makes me pay a lot more attention to my body much more than I like to and I usually end up feeling like I'm a freak because NO pattern ever fits right out of the envelope! And then I decide, "Well, I can modify this so it will fit really well." Even though previous fitting experiences have been quite frustrating, with no clear lessons learned, and no actual pattern at the end that I feel can be used again...so frustration without reward. As I said, why do I sew?! And why do I think I can make something fit?! Sorry for the rant! Onward! This dress needs a matching jacket. I have tried a couple of different versions of the one in the pattern (See & Sew B5699), but wasn't thrilled with them. They're okay, but not that great. So I was getting ready to go ahead & cut my lovely navy wool & silk/rayon lining (thank you, Mood! ), and decided, no, let's try something else. 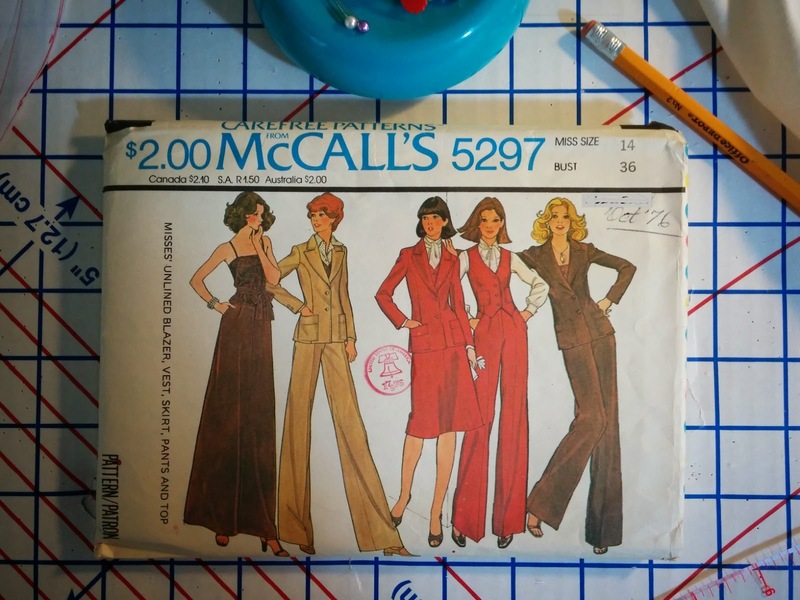 Digging through my pattern boxes, I came across McCall's 5297 from 1976, which my mom gave me recently. (I think she might have made it for my sister? I don't remember it being for me.) 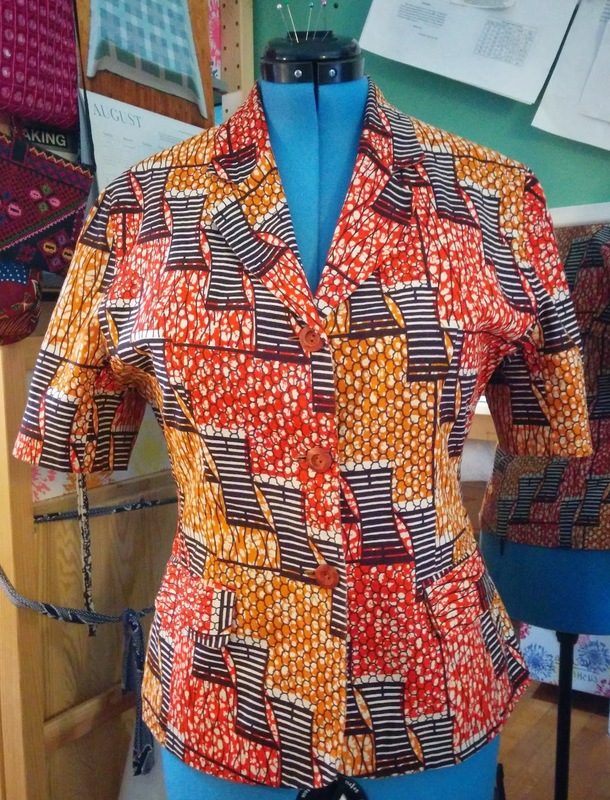 Anyway, the jacket looks good, it's with princess seams (which always work better for me), and I just want to shorten it & round it a bit, so it's a bit more like this Mohammed-Make out of some of my beloved West African fabric. I get a lot of use out of this jacket, wearing it over tops or by itself with skirts and dresses. So I started a toile/muslin. And was quickly reminded that even though princess seams are pretty good for fitting me, they're not perfect either...even this wonderful jacket from Mohammed is too loose at the waist. So, I started playing with 5297 & ended up making it a bit more like the one above. Specifically, that meant turning the front side piece into 2 pieces, like the jacket above. Essentially I went from 4 jacket front pieces (not including lining & interfacing) to 6. It took lots of cutting & trimming & pinning, and of course I'm not 100% sure it's right, but I found some free cotton I'd been given & decided to try it all out. If that works, then I'll get to work with the wool. You can see to the right that I did lots of tracing/drawing and modifying. I used lots of scraps from other projects & from old sheets I get at Goodwill. You can see my Frankentoile to the left, using 4 different pieces. One thing that is good (I guess) is that most pattern pieces fit me perfectly through the back. It's sort of amazing how I match that part so well. At least I don't have to fuss with that. Just the sides & front! By the end of the day, I had the cotton version cut out, put in a new needle, wound a bobbin & did the back neck darts & center back seam. A day spent fitting & cutting out & even making a bit of a start on the actual sewing...not too bad! I really need to get cracking on See & Sew B5699, the jacket anyway, so I've got something new to wear this winter. 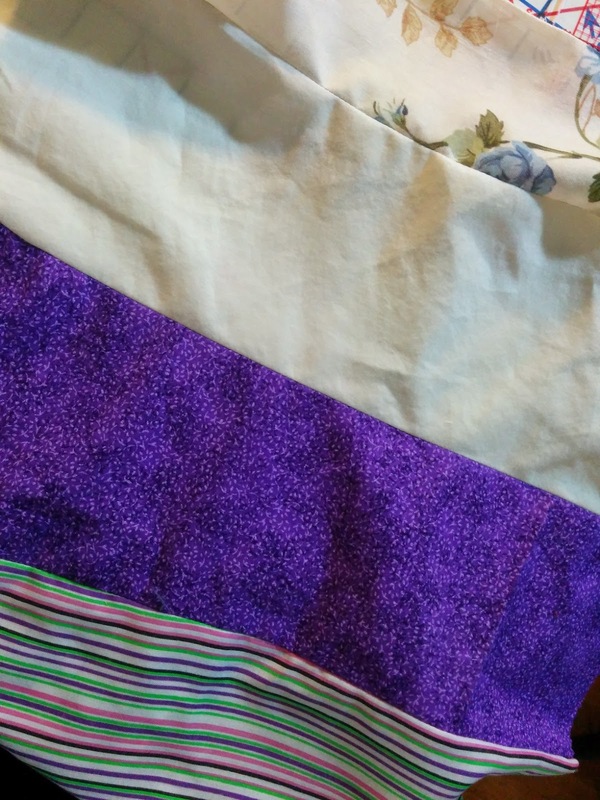 However, I got some free fabric a few weeks ago and decided to use some to make a new nightgown, and to finish up a smocked pillow that has been laying around for months. So here are those 2 items, which have cleaned off my sewing table, giving me plenty of room to get that wool out & start cutting! The mother of a colleague taught Home Ec & Sewing in a public school in Pennsylvania for years. And she has a ton of fabric. My colleague is trying to get her to start cleaning out her basement, so she brought me a bag. This 100% polyester is something I'd never buy. But since it's pretty & feels silky, I thought it would make a good nightgown...and I can always use more nightgowns. Years ago I bought a nightgown which I really liked, but it finally wore out. Since then I've made 3 which are essentially copies of it. This is one of them. It's a quick project & I like how slick & silky the fabric feels. 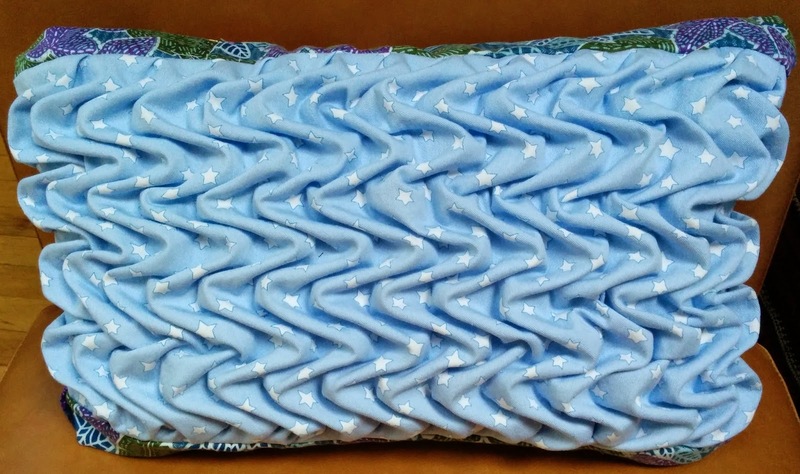 And this morning I finished another smocked pillow! Again, some fabric I got free (on www.freecycle.org); it's a light denim and there wasn't much (less than 1/2 yard), so a pillow seemed like an obvious project. As with nightgowns, I can always use another cushion cover & I enjoy all the different textures created by the smocking around the house. I have only been using smocking on household items, but here's an amazing example of smocking on a dress, from a sister-blogger, from a 1960s pattern. Slenderette Tropicale - Simplicity 2847, 1958 - Done! Simplicity 2847 Slenderette pattern I've made; older ones here. I love a shirtwaist! 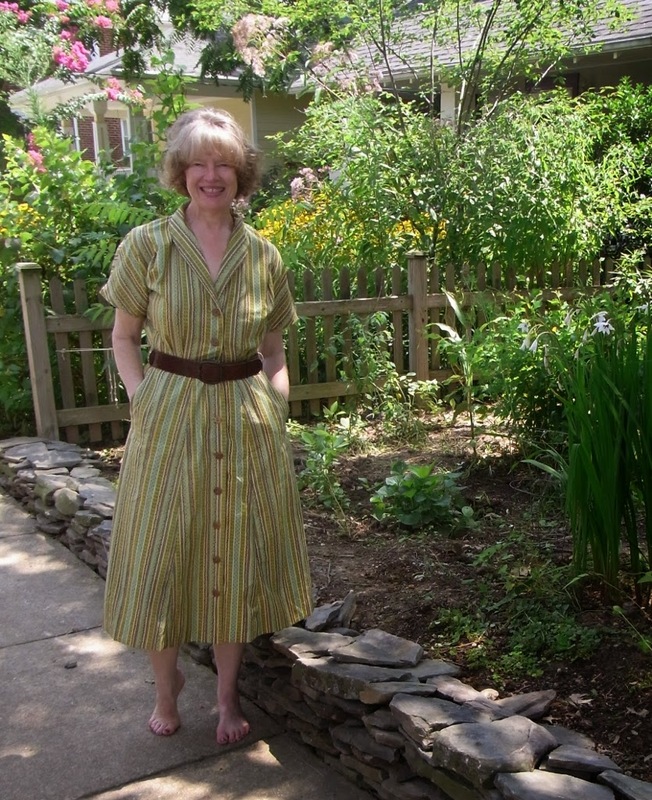 And here I am modeling it in front of our garden, which we began working on in earnest this year (as opposed to just mowing the grass & ignoring it). It's coming along quite well & is mostly native plants now. We've been in the house 3 years now, and have done lots inside...it was time to stop being bad neighbors & spruce up the front. The Roommate & I also made the low slate wall you see...we are inordinately proud of it & it looks great--really adds a lot to the yard. All of which is a way of saying, this is why I haven't been sewing much, and why the one thing I have been sewing has taken forever! Another reason it took forever? Because it's fully lined with silk & I used Hug Snug seam binding all over the place. It looks great inside, as you can see. I do love this pattern! 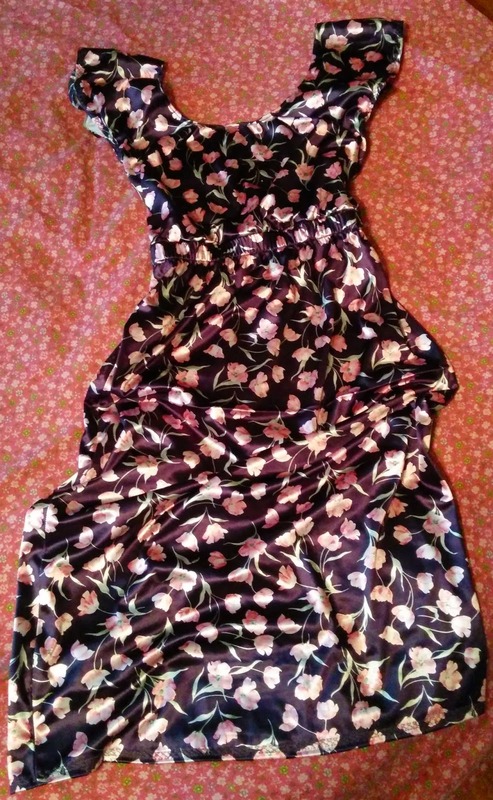 It's got pockets, which I always look for on a dress. It's a really interesting pattern also because the bodice front & back have the sleeves built in...meaning no sleeves to inset, which I hate. It does have lots of buttonholes, though, which makes up in difficulty/impatience for the lack of sleeves! The buttons are juniper, and we got them in Tallinn when we were there about 2 weeks ago. I bought 8, not really sure what I'd do with them, and then got home & realized they'd match perfectly with the Tropicale. I get a lot of use out of my other Slenderettes, so I'm expecting to wear this quite a bit over the next few months before fall sets in.